Carbon Fiber gussets allow for a simple method to bond together flat stock. 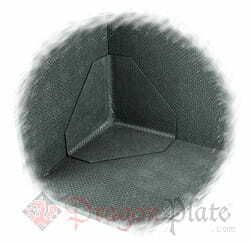 This is a simple way to create an array of structures using DragonPlate carbon fiber sheets, eliminating the extra cost unnecessary tube or beam supports. Our corner gussets are already molded to 90 degree angles, which will save much time and energy in assembly and the creation of fixtures. Our carbon fiber corner gusset can also work well with our square tubing as an alternative to our three way corner gusset. These carbon fiber gussets are made with a texture by texture finish for an ideal bonding surface, utilizing a quasi-isotropic, symmetrical lay up schedule and a rigid epoxy matrix. Our gusset plates have been designed to work with our Scotchweld #2216 epoxy adhesive kit. This is an ideal structural adhesive with extremely high shear and peel strengths.